This post is about Rato Machhendranath Rath Jatra festival of Nepal. 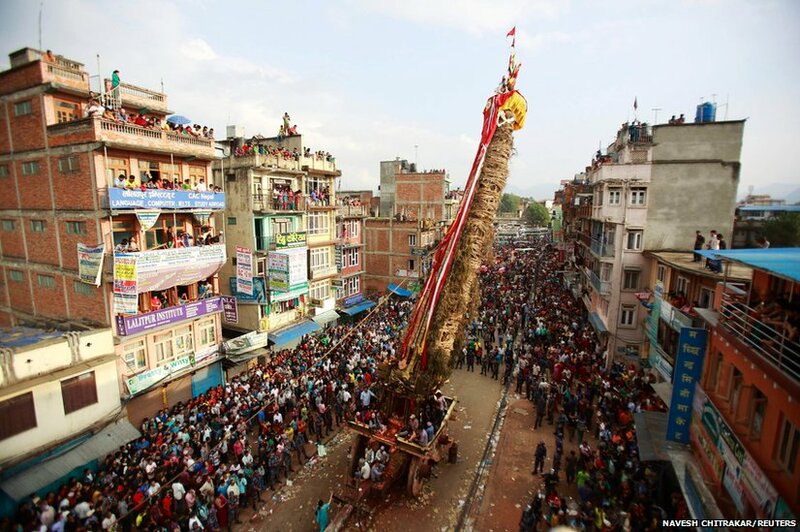 Rato Machhendranath Rath Jatra is one of the longest and most interesting festivals in Patan, Nepal. The Rato Machhendranath Jatra festival is believed to have started in 11th century. It is Chariot Festival of Nepal. Rato Machhendranath Rath Jatra is also termed as Rato Machhindranath Rath Jatra or Red Machhendranath Rath Jatra. Rato means Red. Machhendranath is a deity of this chariot festival of Nepal. Rato Machhendranath Jatra is also one of the chariot festivals of Nepal. It is belief in Hindus people that Rato Machhendranath is a god of rain. Both Hindus and Buddhists in Nepal worship the deity, Rato Machhendranath. Hindus regard him as the reincarnation of the Lord Shiva. The Buddhists regard him as the Tantric reincarnation of Avalokiteshvara. Rato Machhendranath temple is located in the southern part of the Patan Durbar Square since 1673. Rato Machhendranath Jatra festival held in late April. This Chariot Festival of Nepal is one of the major festivals of Patan, Nepal. Rato Machhendranath Jatra festival is similar to the Seto Machhendranath Rath Jatra festival held in Kathmandu, Nepal. The main difference between Rato Machhendranath Rath and Seto Machhendranath Rath is that Seto Machhendranath Rath takes a month to complete and Rato Machhendranath Rath, the chariot is much larger. The deity of Rato Machhendranath Rath Jatra is shared with the village of Bungamati. Bungamati is close to Patan. Every twelfth year the chariot of Rato Machhendranath Rath Jatra itself has to be taken to Bungamati. Road may be very hilly and far from smooth. Each year the deity Machhendranath spends three months in Bungamati but in these intervening years, it is carried there on a palanquin. The festival Rato Machhendranath Rath Jatra begins a Pulchowk, Kathmandu, Nepal. Pulchowk is the place where the chariot of Rato Machhendranath Rath is built. The locals build a 60-foot tall chariot in Pulchowk. For about a month it wends its way through the streets of Patan, Nepal. Because of this immense size of Rath, members of the army are called upon to assist in pulling the chariot. The culmination of the festival is at Jawalakhel when the bejeweled tunic. It is believed that it is supposedly belonging to the serpent king. Rath is publicly displayed at Jawalakhel. On a specially selected day, Rath was displayed in front of the king. However, it is displayed in front of the president. There is no monarchy system anymore in Nepal. There is now republican democratic system in Nepal. The purpose of the festival, Rato Machhendranath Rath Jatra is to ensure a satisfactory monsoon for the rice crop in the paddy fields. Rato Machhendranath temple is one of the oldest temples of Patan, Nepal. Rato Machhendranath temple is also known as Patan temple. This temple of Rato Machhendranath dates back from the 16th century. Rato Machhendranath temple is one of the famous temples of the Kathmandu Valley, Nepal. It is located in the southern part of the Patan Durbar Square. Bungamati village of Patan is one of the popular places in Patan, Nepal. Bungamati village is one of the traditional Newar towns in the Kathmandu valley. It is located 10 km from downtown Kathmandu. The Bungamati village is regarded as the birthplace of deity Machhindranath. The temple of Rato Machhindranath is located in the heart of this Bungamati village. We know that it is one of the longest festivals celebrated in Patan. It is celebrated in April-May. The main reason to celebrate a chariot festival in Nepal is to show respect to the rain god, Machhendranath. Because Rato Machhendranath Rath Jatra festival is celebrated just before the monsoon season starts. It is belief that the city will get plenty rainfall for good growth of crops. Rato Machhendranath Rath Jatra festival is celebrated for the peace and prosperity of the countrymen of Nepal. the Rath Jatra festival is the festival of pulling the chariot of Machhendranath. It concludes in Jawalakhel after the formal showing Bhoto (Vest) in a special day called ‘Bhoto Jatra’. This vest is believed that it belongs to Nagaraj – the Serpent king. After the Bhoto Jatra, Machhendranath is taken back to his temple in Bungmati village. Rato Machhendranath Jatra Date 2014 is April. Rato Machhendranath Jatra Date 2071 is Baisakh. Rato Machhendranath Jatra 2014 is April. Rato Machhendranath Jatra 2071 is Baisakh. Rato Machhendranath Date 2014 is April. Rato Machhendranath Date 2071 is Baisakh. We hope you enjoy this article about Rato Machhendranath Jatra festival of Nepal. If you don’t enjoy this article, please feel free to comment. Who started this festival for the first time?